Sharpie is promoting their stuff and sent over a box of goodies, including the newish Stained by Sharpie fabric markers. These have brush tips so you can make very fine lines or use the side of the pen for slightly broader strokes. They're definitely best for small areas, not large fields of color. 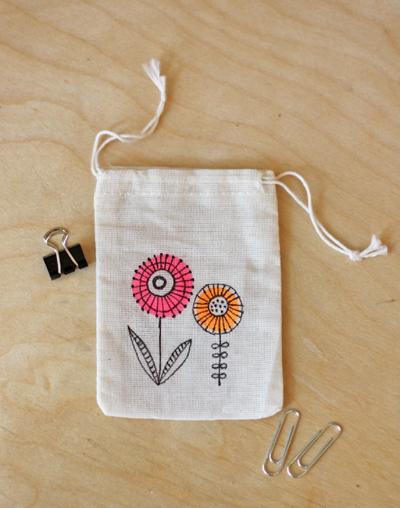 I tested them on a tiny drawstring bag I found in the closet. The colors didn't bleed on the muslin (just make sure the light colors are completely dry before drawing the black on top). Cute, right? You could cover a whole piece of fabric with tiny designs. The markers did bleed a bit on the 7 oz. cotton canvas I used for this zipper-zipper pouch. 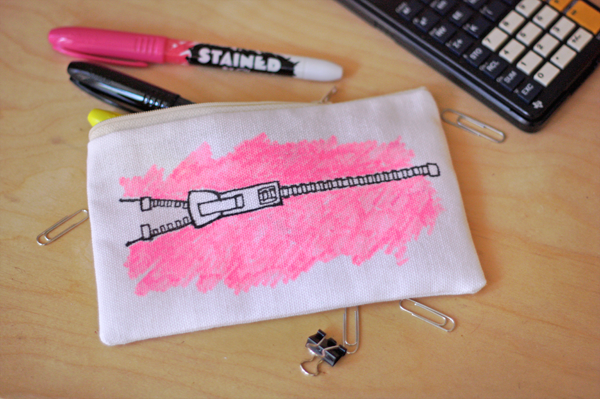 I learned from testing on some scraps that colored areas will likely look scribbly, so on this pouch I went with it. (Click to see it bigger.) If you're looking for perfectly even coverage, this probably isn't your product. Colors can be layered, which will get you a darker, more vibrant look, but your drawing will still appear a bit sketchy. Good for free spirits. Bad for repressed, control-freak designers who like crisp, graphic shapes (um... me). But fun to test! Full disclosure: I was too lazy to illustrate my own zipper, so I Googled "zipper diagrams" and copied one. Something that's not revealed on the package is that the yellow, orange and pink markers are neon like highlighters—I wish my photos captured that better. The other colors are normal. I haven't tried washing anything yet, but the package states that ink resists fading on most fabrics during normal wash cycles. These would be great to do some trompe d'oeil with on garments - I like your zipper drawing you could draw zippers and buttons onto pockets etc. Oh, so pretty! They'd be lotsa fun to play with. MissC'd get a kick outta that zipper-zipper pouch. CoolCrafting: You read my mind! Have you seen this shirt??? Whoops, let's try this link instead. Judging from the Sharpie stains my kids have on their clothing, and using them to write names on clothing, I would guess these will not fade much in the wash.
defo looking out for these - what fun! These sound great! I was looking for a fabric paint my preschoolers could use for a Thanksgiving craft, and I think these will work great! Cheap t-shirts for kids, packet of markers and you have an instant party with terrific results. I love the "sketched" look they give. These are awesome...thanks for letting us know about them! Ooh, I want some! Your projects turned out so cute. Real Simple?!?!?! Woo hoo! I have to go find one immediately! I *must* have these! Where, oh where, can I find them? I love the little bag you've done! Oh, Sharpie, you've done it again. I love you. Oh, wow!! I need to try these!! Are they in stores now, or are they just testing them?? Yep, they're in stores. Or Amazon. Oh man! I've been looking for something to make hand-drawn iron-on canvas patches for my Etsy store. Silkscreen ink thinned down and painted with a brush looks amazing but is too time consuming to be worth it and most of the fabric pens I've tried have a terrible quality of line. Thanks--I'm going to try these this weekend! What a great idea! Love these, so easy. Congrats on the BON! 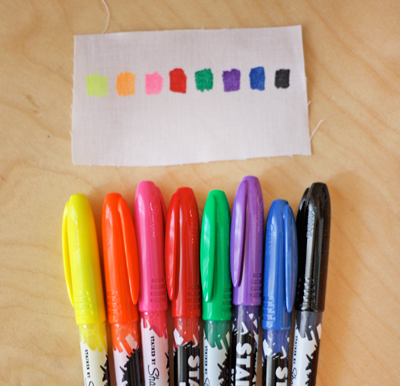 Again, these fabric markers look awesome! Are they opaque on dark fabrics?? those look cool. Wonder if I'll every find them in stores. Wow these ideas are so nice I never thought about using markers like that. Admittedly I have never seen sharpies with such vibrant colors. Maybe they are usually sold out. Awesome designs. I've got to say I'm not surprised about that, since Sharpie seems to be like the trendy marker to go for, with a nice design, but the actual quality isn't amazing (this is what I have learnt from their normal markers anyway). Anonymous, nope—they wouldn't be opaque on dark fabrics. Think of these as more of a stain or dye, than an opaque paint. I love how you demo products for us, complete with the pros and cons. Helpes me a ton when deciding what to purchase! Such fun, and there's neon colours :-) I really like what you made with them!